As UN security guards ripped accreditation badges off of the necks of 3 of my comrades during a staged march out from the UN climate negotiations, I was fueled with both frustration and determination. It was a reminder: when our voices matter the most, they are silenced. That moment defined the atmosphere of oppression and inequality that I, and many others, experienced at the UN climate negotiations in Cancún this past month. 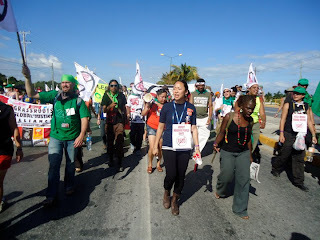 At a march on Dec 7 in Cancún, led by La Via Campesina. Two weeks ago, I was blessed with the opportunity to travel to Cancún to attend the 16th Conference of the Parties of the UN Framework Convention on Climate Change (an unnecessarily long name for the annual UN negotiations on climate change). I went as a representative of Youth for Climate Justice – a national network of young environmental justice organizers who come from communities disproportionately impacted by the effects of climate change. We were there in alliance with a delegation led by Grassroots Global Justice Alliance and the Indigenous Environmental Network. As grassroots organizers from the US, we were there to both influence interests inside the negotiations as well as outside in the streets and through media to push communities at the frontlines of the climate crisis around the world to the forefront of the issue. We were there to amplify the voice of the voiceless, and demand the protection of our rights to survive and the protection of the Rights of Mother Earth. "Respect the Rights of Mother Earth"
But we battled the many contradictions of Cancún and the United Nations. While I was marching in solidarity with small farmers from around the world, who are quickly seeing their livelihoods destroyed by a changing climate and capitalist greed, actual negotiations of a UN agreement to address climate change were deliberated behind tightly closed doors by business men and politicians in suits. As I made the hour-long commute each day through multiple security check points to get to the lavish resort where negotiations happened, I literally felt the reality of climate change and our survival being disconnected from the decisions made by people and corporations in power. Not to mention, we experienced the divide and conquer strategy of the UN as they kept members of civil society groups, and the locations where we convened, blatantly far and inaccessible from each other. 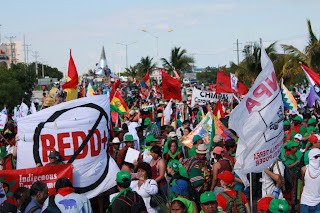 Another image of the La Via Campesina march on Dec 7. So, on December 7th – the international day of action called by La Via Campesina (the international peasants movement) – hundreds of people took to the streets in Cancún in protest. That morning, those of us who had access to the official UN space, joined members of La Via Campesina and others in a march out of the negotiations, fueled by the silencing of our voices and the disregard of our rights, and in solidarity with the hundreds of actions happening around the world to fight for climate justice. During the march out, we were met with angry UN security officials, badges were confiscated, they shuttled us out of the building and many people were put on a list and not allowed back in the following days. You can see video of Democracy Now coverage of the action here. My experience in Cancún deeply affirmed the importance of my work as a young climate/environmental justice organizer dedicated to fighting for solutions to climate change that protect the most vulnerable and ensure a healthy, just future for our generation. We have to demand that our voices are heard, even when they are blatantly silenced. It’s critical that we educate and engage folks from our communities, particularly youth and young people, to be able to stand in the forefront of the fight. As I was in Cancún, the ACRJ SAFIRE youth were back at home, facilitating their own climate justice workshops that we had been working on this fall to other young people in the Bay Area. They were boldly using their leadership and their voice to organize other young people in understanding how climate change impacts our families and our future and to use their voices to tell their stories. It was those stories, and the work of SAFIRE, that I proudly carried with me to Cancún. While our work continues, la lucha sigue (the struggle continues)! To hear more stories and experiences in Cancún, keep your ears open for details about an upcoming report back in the Bay Area by myself and other Bay Area-based activists who attended. More information, and our updates while in Cancún, can be found at redroadcancun.com and grassrootsclimatesolutions.net.